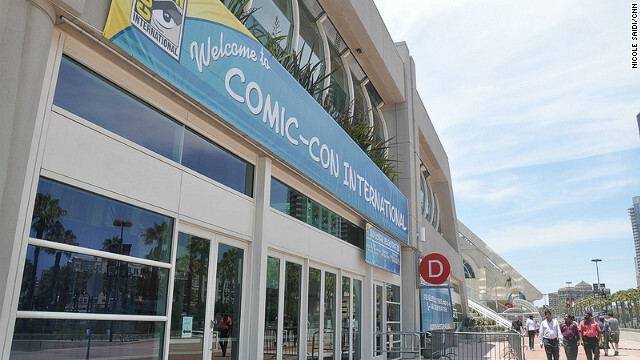 As some of the earliest attendees arrived and checked into their hotels, the areas surrounding the San Diego Convention Center were full of workers, tirelessly finishing displays, exhibits, banners and other preparations needed to kick off San Diego Comic-Con. The annual event, which draws hundreds of thousands to downtown San Diego, has overtaken the area. Local businesses, movie studios, TV networks and video game companies are competing to take their piece of the Comic-Con pie. CNN Geek Out's cameras were there to capture the scene and the finishing touches, as denizens of the business community did anything they could to welcome many new potential customers. Are you at San Diego Comic-Con? Share your photos and video of the sights and sounds. 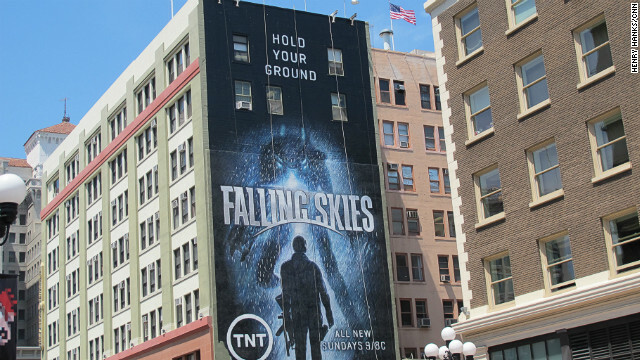 This painted mural for the TV series "Falling Skies" is just one of many building side displays which tower over attendees to San Diego Comic-Con. During San Diego Comic-Con - the largest annual gathering of the comic book faithful in North or South America - the convention, with its banners, murals, and shrink-wrapped vehicles, spills out into the streets of the city's Gaslamp district like lava from a brightly-colored volcano. Promotional art for upcoming films, TV shows and video games is plastered everywhere you look. Even some of the hotel keys and elevators in the city become the equivalent of movie posters. “It’s overwhelming how big everything is and certainly buildings all over San Diego are ‘wrapped,’” said Jon Barrett, Los Angeles bureau chief for Entertainment Weekly. The San Diego Convention Center on Tuesday, just prior to the start of Comic-Con. 300: The number of people who attended the first Comic-Con in 1970. That first Con took place in the basement of a hotel. Among those who remember some of those early days: "Star Wars'" Mark Hamill (who grew up in San Diego) and former "Walking Dead" executive producer, Frank Darabont. 130,000: A conservative estimate of the number of people (including exhibitors, panelists and others) who attended the convention in 2011. 600: The hours of programming officially offered at Comic-Con (there is no way to see everything unless you've perfected cloning, so don't try). That's not counting events near the convention center like Nerd HQ, w00tstock, the Nerdist podcast and more. 460,000: Square feet used by exhibitors in the San Diego Convention Center during the Con. 6,500: Number of seats in the hallowed Hall H, where many of the highest profile panels take place. 2008: The year that Comic-Con was first invaded by Twi-hards. That particular panel in Hall H was the first clue that this movie franchise was going to be huge. Also screened in Hall H: test footage of a sequel to "Tron," which built buzz around that movie over two years before release and "Iron Man" made its wowed the crowd in 2007. 180,000,000: The estimated economic impact, in dollars, of Comic-Con on the city of San Diego each year. 75,000,000: Direct spending, in dollars, by Comic-Con attendees within the convention center in 2011. 14,663; 10,311; 8,160: Hot dogs, bottled water and sandwiches or salads purchased at Comic-Con from food vendors within the convention center alone. One: Number of eyes in the official Comic-Con logo. 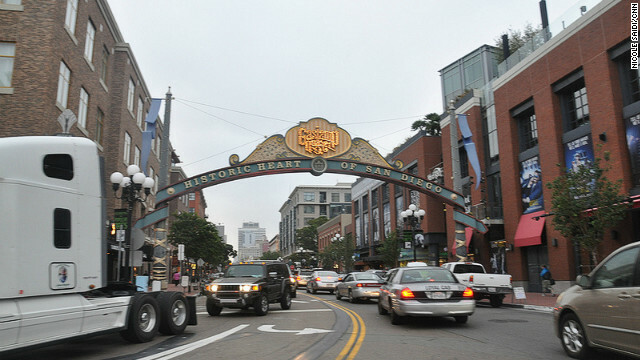 Traffic in San Diego's Gaslamp District on Tuesday, at the corner of 5th Avenue and L street. On Monday, 'Twilight" fans were already lined up to see the popular franchise's final panel Thursday at San Diego Comic-Con. Far from a rowdy bunch, the "Twi-hards," as the fan group calls itself, quietly and insistently brought their sleeping bags, snacks and comfy chairs to the lawn adjacent to Hall H and waited for official lines to start, despite convention organizers' advice not to line up before an official queue could be organized for the historically packed panel. One of those fans, 53-year-old Gisela Gagliardi, was killed near the convention center when walking across the intersection at Harbor Drive and Fifth Avenue in downtown San Diego just before 9:30 am on Tuesday.